Home kid friendly	spring asparagus soup. This months Lazy Susan was perfect for me. This is the first all-veggie (vegan or vegetarian) episode in celebration of Earth Day on April 22nd. Not only is everything veggie, it’s also based on local produce. I think we all know we should try to buy local when possible, but have you ever calculated just how much of an environmental impact your food really has? From production and transportation, to packaging, what we eat can have a huge impact on the Earth. While going vegetarian can certainly help, there are other steps you can take and check just how you, yes YOU, impact the environment every day. Check out this How Green Is my Diet widget for more info. Spring in So-Cal is full of wonderful produce, but none quite as delicious and nutritious as asparagus. We have had a few battles over the last spear standing in out house so I decided to just load up on it this year. If you haven’t tried grilled asparagus, you really should. Preparing it for the grill is quite easy and it tastes so much better than steamed. 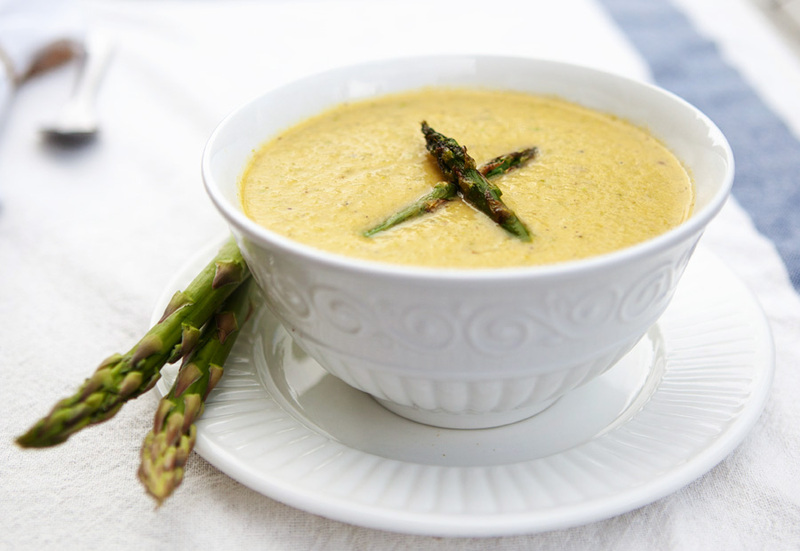 While you can certainly take this recipe and stop after grilling, if you happen to buy a lot like I did, this grilled asparagus soup is so freaking yummy and totally embodies the taste of spring! The most difficult part was not eating all of the asparagus as it came off the grill, but this soup keeps well in the fridge and can be prepared ahead of time for a party. on a pre-heated grill or grill pan, grill asparagus until tender ( approximately 10-12 minutes) turning spears until all sides are lightly browned. cut asparagus into 2 inch pieces reserving a few tips for garnish. simmer onion in 1 cup broth for 3-4 min, add asparagus and simmer another 4 mintues. puree vegetable in blender or food processor until mostly smooth and set aside. in saucepan, melt earth balance and sprinkle in flour while stirring just until combined. add remaining 1 cup veg broth and then vegetable puree. simmer 5 minutes then whisk in soy milk, sour supreme and lemon juice. garnish with grilled asparagus spears and serve immediately. if you use a low sodium or regular sodium broth, adjust salt accordingly! Now it’s time for some gluten-free vegan sushi by Amy Boring, come along with me to see how wonderful vegan sushi can be! delicious food and outstanding photography! This looks and sounds unbelievably delish!!! This looks wonderful. I love just about anything with asparagus, especially soups. Asparagus and I are new friends. We’re actually cooking some tonight from a new CSA box we had delivered. I will be pinning this for sure! OMG I LOVE asparagus. LOVE LOVE LOVE. And this looks divine. Thanks for the fabulous recipe! 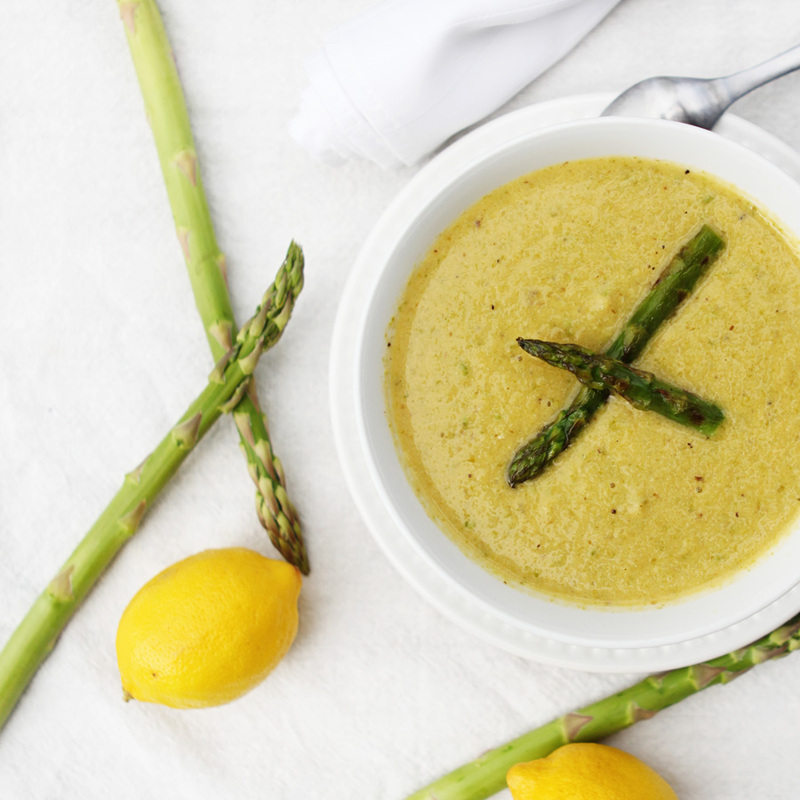 GRILLED asparagus soup? Totally making this. Question…I can’t do soy. Can I sub milk for that? THE BEST thing I have ever tasted. Made it tonight and so very glad I did! My only change was to add 3 cloves of garlic, which I simmered with the onions. Holy crap! This is moving to the top of my “to-cook” list. I love asparagus and this looks heavenly! One question. Where can I get sour supreme? Would Kroger have it or would it be more of a Whole Foods/Trader Joes thing? @Ashlee, Kroger should have it! Sometimes it’s in the healthy food section near the tofu and sometimes it’s next to the sour cream. It’s so good too!